The Center for the Study of Law and Religion at Emory University is launching a new book series on law and Christianity in partnership with Cambridge University Press and with director and acclaimed scholar John Witte Jr. as series editor. He and his colleagues in the field plan to build comparable book series on the interaction of law with each of the other major faith traditions. The Law and Christianity series will draw upon the top scholars around the world to tackle the pressing issues in the field, including religious freedom and human rights at home and abroad; church law and other religious legal systems and their place in modern democracies; Christian foundations of law, politics and society; the role of natural law theory historically and today; the overlapping roles of church and state in the governance of family, education, charity and other areas of mixed jurisdiction; and comparative ethics, hermeneutics and dispute resolution. The series will include new monographs and anthologies as well as translations of leading Christian scholarship on law. In addition to free-standing titles, the series will commission two clusters of titles, using the resources and connections of the Center for the Study of Law and Religion, the AALS Law and Religion Section and various global scholarly guilds. One series will provide introductions for use in advanced college, law school and divinity school classrooms. Witte and Founding Director Frank S. Alexander previously published with Cambridge two prototype volumes: “Christianity and Law: An Introduction” (2008) and “Christianity and Human Rights: An Introduction” (2010). Potential new titles in this subseries of introductions include Christianity and: Family Law, Property Law, Criminal Law, Contract Law, Constitutional Law, International Law, Immigration Law, Procedural Law, Economic Regulation, Natural Law and Church Law. Another series will feature fresh studies of great Christian legal thinkers in different eras and areas of the world. Potential titles include Great Christian Legal Thinkers in: the Ancient World, the Germanic Age, German History, Nordic History, French History, Spanish History, Italian History, English History, American History, Latin American History, African History and Indian History. The Center for the Study of Law and Religion began at Emory 32 years ago, despite warnings from critics that such a center would lead to advocacy for specific faith agendas and fail to produce serious scholarship. Instead, the center has thrived, leading the way in the complex global field of law and religion, and now drawing on Jewish, Muslim, Buddhist, Hindu and Christian scholars. Some 110 American law schools now have at least one course on religious liberty or church-state relations, and a growing number of law schools offer courses in Christian canon law, Jewish law, Islamic law and natural law. More than 750 books and 5,000 articles on law and religion themes have been published in English. More than two dozen new law and religion initiatives and institutes have emerged in Europe, Latin America, Africa and Australia over the past two decades, and 19 specialty journals on law and religion themes are now being published. The Journal of Law and Religion is edited by the Center for the Study of Law and Religion and published by Cambridge University Press. 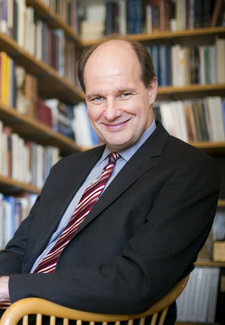 Witte is Robert W. Woodruff Professor of Law, Alonzo L. McDonald Distinguished Professor and director of the Center for the Study of Law and Religion at Emory University. A specialist in legal history, marriage law and religious liberty, he has published 220 articles, 15 journal symposia and 27 books, eight of them with Cambridge University Press. His writings have appeared in 15 languages, and he has delivered more than 350 public lectures throughout the world. With major funding from the Pew, Ford, Lilly, Luce and McDonald foundations, Witte has directed 12 major international projects on democracy; human rights and religious liberty; and marriage, family and children. The Center for the Study of Law and Religion is the field's oldest and most recognized scholarly center. It engages 1,600 scholars worldwide and offers six advanced degrees, 40 cross-listed courses, research projects, public forums, international conferences, two book series and The Journal of Law and Religion.